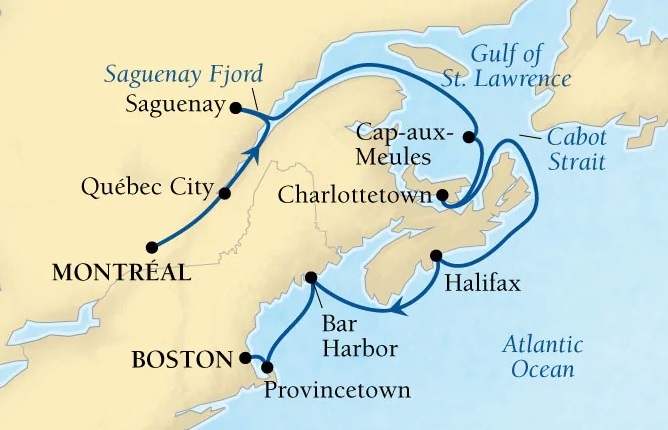 Set sail from Montreal and experience a journey full colours, flavours and history. From the cultural heart of French Canada to the start of the US liberty trail, this tour is a must for any modern history buffs. But for those who just want a relaxing cruise this is still for you as you idle past the Autumnal colour of the famous New England coastline. Complimentary Veranda for Ocean View Upgrade. Up to $1,000USD per suite shipboard credit on Penthouse and Premium Suites. * All prices quoted are PER PERSON in Australian Dollars and include taxes, fees and port expenses (if applicable). All prices quoted are for the cruise departing on 03Oct19. Prices for alternative departure dates may vary. Gratuities included. Features include a living room with convertible sofa bed for one and dining area, bathroom with separate whirlpool tub and shower, guest bath, butler pantry with wet bar, veranda, glass-enclosed solarium, bedroom with queen-size bed or two twin beds, large walk-in closet with personal safe, two flat-screen televisions with DVD and fully stocked bar. Features include a living room, dining area and forward facing windows, two verandas, bedroom with queen-size bed or two twin beds, large walk-in closet with personal safe, bathroom with separate whirlpool tub and shower, guest bath, two flat-screen televisions with DVD, butler pantry with wet bar and fully stocked bar. Features include a living room, dining area, forward facing windows, spacious veranda, bedroom with queen-size bed or two twin beds, large walk-in closet with personal safe, spacious master bathroom with separate tub and shower, guest bath, two flat-screen televisions with DVD, butler pantry with wet bar and fully stocked bar. Features include a living room, dining area, forward facing windows, two verandas, bedroom with queen-size bed or two twin beds, large walk-in closet with personal safe, spacious master bathroom with separate tub and shower, guest bath, two flat-screen televisions with DVD, butler pantry with wet bar and fully stocked bar. Features include a living area with convertible sofa bed for one, bedroom with queen-size bed or two twin beds, large walk-in closet with personal safe, spacious bathroom with separate whirlpool tub and shower, glass door to veranda, guest bath, flat-screen television with DVD and fully stocked bar. Features include living area with dining for four, glass door to private veranda, separate bedroom with queen-size bed or two twin beds, wardrobe closet with personal safe, two flat-screen televisions with DVD, fully stocked bar, spacious master bathroom with roll-in shower. Features include living area with dining for four and separate bedroom with queen-size bed or two twin beds, glass door to private veranda, walk-in closet with personal safe, two flat-screen televisions with DVD, CD stereo player, fully stocked bar, makeup vanity and spacious bathroom with separate tub and shower. Features include living area and bedroom with queen-size bed or two twin beds, full-length window and glass door to private veranda, wardrobe closet with personal safe, flat-screen television with DVD, CD stereo player, fully stocked bar, makeup vanity and spacious bathroom with separate tub and shower. Features include living area and bedroom with queen-size bed or two twin beds, full-length window and glass door to veranda with partial glass windscreen, wardrobe closet with personal safe, flat-screen television with DVD, CD stereo player, fully stocked bar, makeup vanity and spacious bathroom with separate tub and shower. Features include living area and bedroom with queen-size bed or two twin beds, full-length window and glass door to mini balcony, wardrobe closet with personal safe, flat-screen television with DVD, CD stereo player, fully stocked bar, makeup vanity and spacious bathroom with separate tub and shower. Features include living area and bedroom with queen-size bed or two twin beds, picture window, walk-in closet with personal safe, flat-screen television with DVD, CD stereo player, fully stocked bar, makeup vanity and spacious bathroom with separate tub and shower. 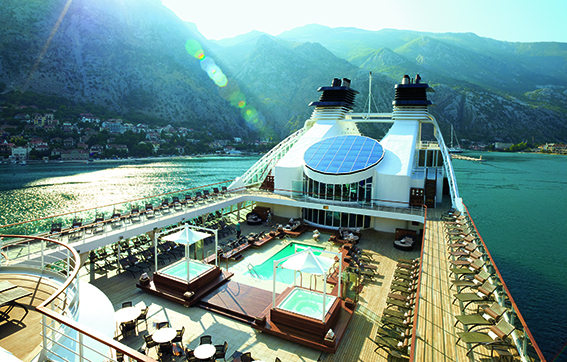 Debuting in June 2011, Seabourn Quest offers 225 luxury suites, four dining venues, and six bars and lounges. Seabourn QuestSM is sure to delight you with its varied menus in four restaurants as well as in-suite dining. The Restaurant offers eclectic menus developed specifically for The Yachts of Seabourn by celebrity Chef Charlie Palmer. Seabourn’s chefs shine as each restaurant offers discerning guests a different experience, from avant-garde tasting menus to casual meals on deck. In Seabourn Square, enjoy traditional Italian espressos and lattes at your leisure or stop by one of our six bars and lounges and enjoy world-class wine, champagne and top shelf spirits. Our gourmet open-seating Restaurant spares nothing offering guests Charlie Palmer’s exceptional cuisine at tables set with exquisite china and crystal. Most evenings, attire is just “jacket required.” On special nights we host candlelit black tie optional dining. After dinner, dance the night away in the sophisticated supper club setting. Intense flavors, stellar service and intriguing food and wine pairings are the specialties of the house in this avant-garde restaurant. Dishes are prepared individually by the chef in tasting portions so you can enjoy a selection of innovative creations. Restaurant 2 will quickly become one of your favorite dinner spots aboard Seabourn Quest. Exclusive to Seabourn Quest is our indoor/outdoor restaurant, The Colonnade. Here, chefs serve breakfast, lunch and dinner in an open kitchen so you can watch them work their magic as they personally prepare your order. Each evening has a different theme, offering guests an ever-changing culinary experience. If you’re in the mood for casual dining at its finest, enjoy breakfast, lunch or dinner poolside at the Patio Grill. The superb offerings are sure to delight your palette as you enjoy the relaxed ambiance by the pool. If you’re in the mood for a late night pizza or just some fresh crudités in your suite, we offer an extensive room service menu around the clock. During dinner hours, you can choose to have dinner served course by course in your suite, complete with fine linens and personal service. Step into our magnificent sanctuary of health and fitness – The Spa at Seabourn – and let your senses and spirits soar with our innovative therapies, state-of-the-art fitness center and full-service salon. With a panoramic sliding glass wall that leads to our outdoor relaxation area, The Spa at Seabourn covers two decks. Here, you can succumb to temptation. Enjoy a variety of treatments in one of our seven private treatment rooms or experience the renewing energy of the ancient Chinese arts of reflexology and aromatherapy. If you’d like, step into one of our Finnish saunas or aromatic steam rooms for some traditional therapy or slip into the thalassotherapy pool and let its waters work their magic. Or explore the healing properties of warm stones, seaweed wraps or full facials. Don’t know where to start? Ask one of our certified massage therapists and they will be happy to custom design a spa package based on your preferences. For those who want a workout, head over to our fully-equipped gym with state-of-the-art cardio, strength and weight training equipment. If you wish, you can have a personal trainer work with you. Be sure to try the KinesisTM Wall, a unique pulley and cable system that is the newest, most innovative method of exercise available today. Finally, enjoy a manicure or full makeover in our full-service salon. Our staff will ensure that you glow from head to perfectly pedicured toe. Seabourn Quest also has a Kinesis system and offers free Kinesis classes as well as Kinesis personal training. Be sure to try the KinesisTM Wall, a unique pulley and cable system that is the newest, most innovative method of exercise available today. It provides an enjoyable and challenging workout for your mind and body, using three dimensional movements that improve balance, flexibility and strength. On select, warm-water cruises, the captain will anchor and deploy a water sports Marina, inviting guests to enjoy board sailing, water-skiing, kayaking, banana boat rides and pedal boating right from the ship. A steel-mesh enclosure allows safe swimming in the sea. Discover for yourself why The Spa at Seabourn was rated the Top Cruise Line Spa by the readers of Conde Nast Traveler. The expert therapists will soothe your senses and renew your inner glow. The Spa at Seabourn offers guests the opulent option of reserving one of our expansive 750-square foot Spa Villas for a hedonistic half-day of shamelessly sybaritic indulgence in serene and sumptuous surroundings. Seabourn’s skilled spa staff will provide guests with their preferred combination of rituals, as they relax in an airy, palatial private retreat encompassing separate seating and dining areas, an indoor double bed lounger, two treatment beds, an oversized bathtub and separate shower, as well as a private wraparound terrace with sun loungers in the open air. Wheelchair Accessible Suites. Suites 408, 519, 619, 635, 715, 813 & 913 are wheelchair accessible, roll-in shower only, wheelchair-accessible doorways. 516 to 538 sq. ft. (48 – 50 sq. m.) of inside space, plus expansive aft-facing private verandas of 172 sq. ft.(16 sq. m.). Approximately 365(34 sq.m.) sq. ft. Approximately 436(41 sq.m.) sq. ft plus one veranda totaling 98(9.1 sq.m.) sq.ft. Suite 913 is approximately 300(27.7 sq.m.) sq. ft pluse one veranda of 65(6.1 sq.m) sq.ft. plus one veranda of 65(6.1 sq.m) sq.ft. the layout of suite 913. Approximately 526(49 sq.m.) sq. ft. – 593(55 sq.m.) sq. ft. plus veranda totaling between 133(12 sq.m.) sq. ft. – 354(33 sq.m.) sq. ft.
Roll-in shower, wide interior & exterior doors, private veranda. The schematic shown here displays the layout of suite 813. Combine mid-ship suites 743 & 745 or 744 & 746 for a total inside space of 1,189(110 sq.m) sq.ft. plus two verandas totaling 214(20 sq.m) sq.ft. Inside space of 914(85 sq.m) sq.ft. plus one veranda totaling 183(17 sq.m) sq.ft. Combine forward suites 700 & 702 or suites 701 & 703 for a total inside space of 1,159(107.4 sq.m) sq.ft. plus two verandas totaling 558(51.9 sq.m.) sq.ft. Inside space of 859(79.7 sq.m) sq.ft. plus one veranda totaling 493(45.8 sq.m) sq.ft. The schematic shown here displays the layout of suite 715. Roll-in shower and separate tub, wide interior & exterior doors, private veranda. The schematic shown here displays the layout of suite 635. The schematic shown here displays the layout of suite 619. One Queen-Size Bed Only (No twin option). the layout of suite 519.
here displays the layout of suite 408.